Are you planning a migration off Citrix XenApp or XenDesktop? Or looking for ways to make them run as good as you thought they should? Then this is the session for you. Come hear from the architect of VMware's Citrix migration and enhancement strategies as he explains how key VMware technologies such as Horizon, App Volumes, Instant Clone and NSX can help. We will dive deep on how to evaluate the state of the Citrix environment, assess project requirements and review real world scenarios. By the end of the session you will know all about the best-practices, tools and services available to ensure your project is a complete success. 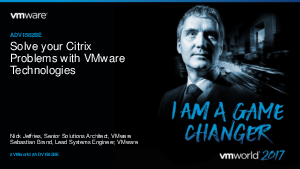 Download the webinar to learn how VMware technologies can help solve your Citrix problems!